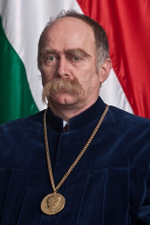 Dr. Kovács was elected Judge of the Constitutional Court by Parliament in September 2005. He graduated from the Faculty of Law of József Attila University in 1983. After his studies at the European University Centre, Nancy, in 1983/84, he received his law degree specialized in community rights. For his thesis “Protection of fundamental rights in the community rights system”, 1987, he was awarded the title of “doctor universitatis” at the University of Miskolc, accredited as a Ph.D. degree in 1996. He qualified as a university lecturer in 1997. From 1983 he was senior lecturer, from 1998 university professor, between 1999 and 2005 head of Department for International Law at the University of Miskolc. He was granted full professorship, and between 1997 and 2005 he was head of Department at the Catholic University Pázmány Péter. Between 1990 and 1994 he worked at the Embassy of the Republic of Hungary to Paris, within the staff of the Ministry of Foreign Affairs, while in 1998/99 he was head of Department for Human Rights and Minority Law. In his quality of governmental expert, he took part in the elaboration of two conventions on the protection of minorities, concluded under the auspices of the Council of Europe, namely the European Charter for Regional or Minority Languages and the Framework-convention for the Protection of National Minorities in Europe. As a visiting professor, he gave lectures at several universities in France: Montpellier (one month in 2000), Paris XI (one month in 2002), Paris II (one month in 2003), Nantes (one month in 2003); as well as in the United States of America (six months in 2002, Denver, Fulbright scholarship). He is a member of the “Société Française pour le Droit International”.